"Hey, that's my story!" my mentee Adan Gonzalez blurted out as I read him some of the preliminary findings from a study the Hispanic Heritage Foundation, myCollegeOptions and the Family Online Safety Institute (FOSI) conducted called Taking the Pulse of the High School Student in America. When Adan Gonzalez was a high school student in the rough-and-tumble Oak Cliff neighborhood in Dallas, TX, he had dreams of going to college, being a boxer and launching a national effort to support disenfranchised youth through education, empowerment and networking. But first he needed to get through high school. Then he needed to apply for college. And for college grants. The easy part, he thought, would be actually going to college. At one time, Adan shared one bedroom with six others while his father worked long hours as a custodian and mother held odd jobs to help feed the family. Unlike many other students in America there was no internet in his apartment or complex, and too often no electricity. To complete homework requiring online access, he would walk late at night, after sports practices, to a McDonalds or Starbucks and lean up against the building to catch enough of the sporadic Wi-Fi signals to finish his assignments on a borrowed laptop. When he had to research and apply for colleges, he literally hit the streets in search of a signal that didn't have a password attached to it. College grants were accessed the same way, through this maddening process akin to finding water with a divining rod over a hundred years ago. Fortunately, Adan was resourceful enough, diligent enough and indefatigable enough to hurdle over this gap in technology which traps many other disadvantaged youth. The Pulse Study found that Adan was not alone in his struggle to find Internet access. Nearly 60 percent of students use their smart phone to access the internet but nearly 80 percent of Hispanic students who do not have regular access to a computer at home use their smart phones to access the internet, which leads to, yes you guessed it, Hispanics being the mostly likely to use a smart phone to complete a homework assignment or college application. Hispanics also were found to be the most likely to not complete assignment because of lack of access and most likely to have received a lower grade. Time to update the challenges to minority youth 2015-style and we should definitely start with the technology gap. Or the "Homework Gap" as FCC Commissioner Jessica Rosenworcel calls it. 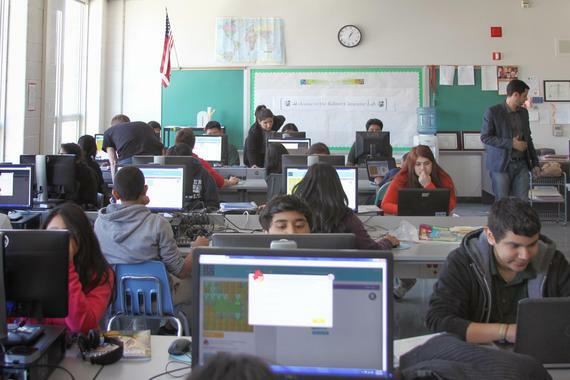 "The Pulse Study research is not only important but bone chilling because it clearly demonstrates that we have work to do if we want all students to have a fair shot in the digital age," said Commissioner Rosenworcel. "Today, as many as seven in 10 teachers assign homework that requires access to broadband but data at the FCC suggests that as many as one in three households do not subscribe to broadband service. Where they overlap is what I call the Homework Gap-- according to the Pew Research Center five million households of the 29 million with school-aged children are falling into this gap." And it's not just minority students, the Pulse Study found that overall, nearly 50 percent of all students said they have been unable to complete their homework because they didn't have access to the Internet or a computer, and 42 percent of all students said they received a lower grade on an assignment because they didn't have Internet access. In today's digital landscape, students can't learn as efficaciously without the Internet. Going forward into tomorrow, there will only be a bigger gap between the Internet haves and the have nots. As the have nots continue to struggle to keep up, our entire educational system will also struggle to keep up globally and subsequently our workforce. And that's an even bigger problem in the near future according to Commissioner Rosenworcel. "That's a problem because one-half of all jobs now require some level of digital skills. By the end of the decade, that number will be 77 percent. School-aged kids without broadband access at home are not only unable to complete their homework but they enter the job market with a serious handicap. And that loss is more than individual. It's a loss to our collective human capital and shared economic future that we need to address." And it's not just students who are at a disadvantage, teachers can't teach as effectively without adequate broadband access. According to Pew Research Center's findings titled How Teachers are Using Technology at Home and in their Classroom over 50 percent of teachers in low-income areas said their students' lack of online access at home presents major challenges to working technology into their teaching, which is increasingly technology dependent. So, even from a teacher's perspective, students and their parents are hindered by a lack of access to the Internet. And according to the Southern Education Foundation's A New Majority Research Bulletin, for the first time in United States history, more than half of public school students are from low-income households, which as you can imagine are dramatically less likely to have broadband access. To address this tech or homework gap issue, we need to get creative. For instance, Commissioner Rosenworcel told me about a public library in New York which is piloting a program that lends out wireless hotspots to students or families the way they would check out books. Now think of a hotspot being lent out to a student - it could mean the difference between passing or failing in school. And it's the same sharing of resources as other products community members can access at public libraries. A great combination of simple, sensible and accessible. There's also the example of the Coachella school district in California, which is mostly an agriculture community. More than half of the students are not fluent in English with most of the parents being migrant farm workers. The school superintendent developed a program to give every child a tablet for use at school and home but there was a problem to his vision, students sat outside of his office every day long after the final bell had sounded because it was the only place where they could be a good signal to do their homework, despite having a tablet. So the clever superintendant installed Wi-Fi routers on district school buses - in rural areas, students spend up to an hour each way to and from school which provided up to two hours of connectivity to do homework! The school system parks buses next to some of the most remote trailer parks in the district with the Wi-Fi routers on so students least likely to have broadband at home have yet another way to connect to the Internet. It will take innovative solutions as well as a collective effort by the private, public, education and community-based institutions, to make it easier for the Adan Gonzalezes to move forward. Oh, last week, Adan graduated from Georgetown University decorated with national awards, was captain of the boxing team, and has engaged over 10,000 youth through his Si Se Puede Network. Yes, this was his story. And now we need to change it so others can have the same uplifting ending without as many twists in turns in the story.